Last stop for EL Bonnie before hitting the "great white dyno" AKA the Salt Flats, was a mechanical dynomometer. Like much of the rest of the project, this too proved to be somewhat less straightforward than planned. Faribault Harley Davidson had come on board as a sponsor in the form of providing dyno work. Only one problem; about the time Joe and Terry were feverishly working to install the modified 61 inch motor in the EL Bonnie chassis, the FHD dyno was in the process of taking some time off (I think the term technical description was that "it blew up"). 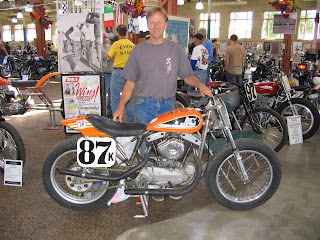 Since repairs to the Faribault dyno were not possible in time for the Knucklehead, another plan was needed. A call from team member John Endrizzi to Pat Lehmann of Rochester Harley saved the day. Pat graciously agreed to come in on his day off to establish the baseline jetting using their SuperFlow Dyno. The following video documents some of the dyno testing. A couple notes about the video; the first thing that you may notice is the ingenious starter system that Joe Taylor came up with. It consists of a snow blower with a go cart wheel attached in place of the rotor. Also noteworthy is that when you see Pat with the welding gloves on, it is because the plug wires kept coming loose from the magneto at RPM. Eventually he was forced to hold them in place during the dyno run. Finding this one issue alone, before making the trip all the way to the salt, was priceless. So, what was the horsepower? I guess we just don't know. I knew going in that the dyno would probably not pick up a usable trigger from the magneto. The lack of a tachometer on the bike was also an issue. After some initial warm up runs and jet changes, Pat broke out an optical pickup which he set up to run off the engine pulley, but since he had never had occasion to use it before, there was some question as to the readings it produced. The actual readings showed over 120 horsepower at around 4800 RPM - obviously that was incorrect (at no time during the dyno session did the engine reach maximum RPMs). The RPM readings from the optical pickup seemed to be right though. After the fact I mathematically calculated the RPM from the wheel speed, confirming that the optical pickup was providing accurate data. If the horsepower readings we saw meant anything, my guess is that they were reading double the actual horsepower figure, but since the engine was only taken to about 4800 of what I hoped would be a 7500 RPM top, even that told us very little. Two local racers, who incidentally carry the Lee's Speed Shop logo on their steeds, finished the season in style. Joe Lieske, aboard his V-Rod based gas dragster came home with the AMRA's V-Mod National Championship. Joe sealed the deal with a big win at the National Finals in Bowling Green. I am a little embarrassed to admit I have lost count of the National event wins he stacked up for the season, but I do know that Joe came home with 4 National Records along the way. In late March and early April he set the 1/8 mile ET record at 5.564 seconds, as well as both ends of the 1/4 mile record: 8.917 ET and 144.55 MPH. In late April Joe lowered the ET record to 8.875 seconds. Congratulations Joe! 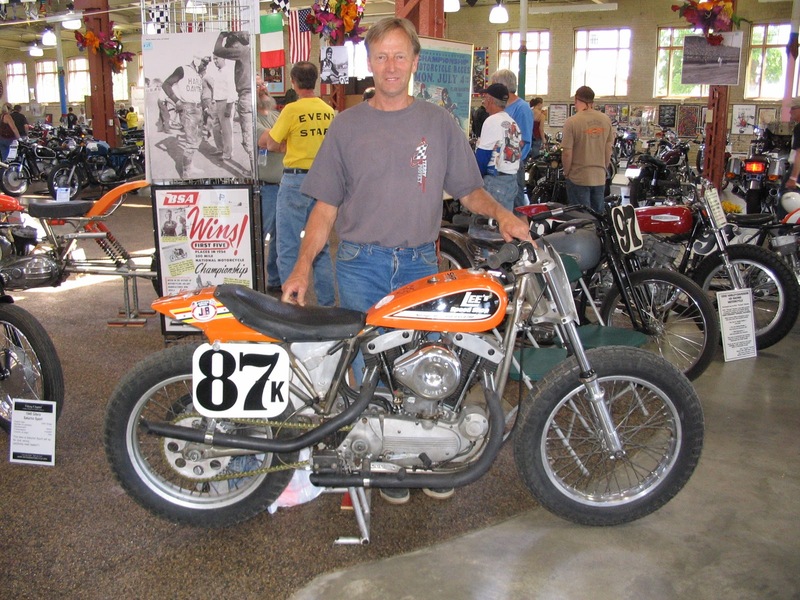 On another front, Bill Hofmeister celebrated his first full year of retirement from riding flat track by, you guessed it, adding another couple wins to his long, long list. This time he rode his 900 Iron Head XR to victory at the long running Flying Dutchmen's New Ulm Short Track; not without incident however. During a heat race, problems with the rear brake forced Bill to completely remove the caliper and mount for the Open Twin Main, and since the bike sports no front brake, ...well, let's just say it is pretty plain that old age hasn't dimmed his competitive spirit much.